One side effect of the three-ring circus this presidential campaign has become is the distraction it provides so that other damaging agendas can be advanced with little or no attention. Take for example, the Republican Party's long-standing efforts to dismantle America's internationally modest, but still crucially important welfare state, which helps keep tens of millions of Americans out of poverty. Social Security and Medicare have both been top targets via various schemes over the years, and this budget cycle is no exception, regardless of what noises Donald Trump may make. These congressional cuts would even force workers to take a two-week furlough. Crippling Social Security's ability to function just when it's needed most is the epitome of what Republican public policy has become. It's part of a familiar right-wing strategy to degrade the quality of government services, then use that degradation to argue for privatization. Not only does Social Security lift tens of millions of retirees out of poverty, but in 2014 3.2 million American kids directly received Social Security benefits, mostly in the form of survivor benefits. Another 10 million disabled workers were covered as well. But it's not just these many millions of people who benefit: Retirement security for grandparents means more money for parents to invest in their children's future. 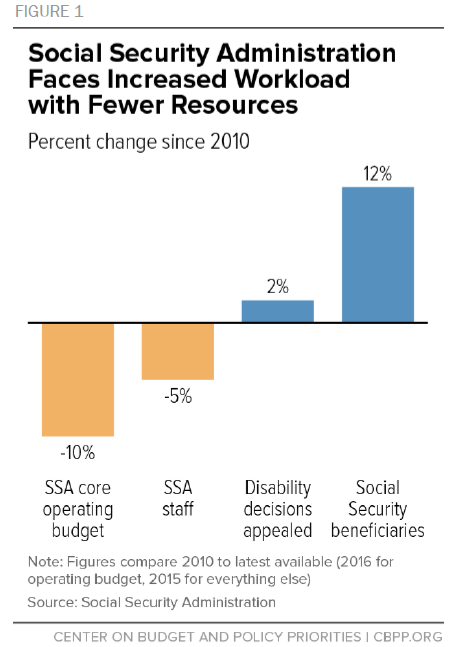 Security for orphans and disabled workers have similar spillover benefits as well. So attacks on Social Security really are a threat to Americans of all ages, now as well as in the future. Those attacks are already well under way, thanks to the austerity measures imposed since the Tea Party first arrived in Washington with the GOP congressional wave of 2010. (The money comes directly from workers — not from the overall Federal budget — but Congress controls the spending.) During the current budget cycle, the attacks are getting worse, even as baby boomer retirements continue to swell the rolls. This erodes confidence in the system, thereby weakening it for even further attacks, privatization and dismantlement — the true conservative dream. A hiring freeze in 2011, leading to “a deterioration in SSA phone service that the agency has only partially reversed,” with average hold times of over 15 minutes on SSA’s 800 number, and nearly 10 percent of callers getting busy signals. Understaffing has delayed critical behind-the-scenes work needed to pay benefits accurately and on time (awarding widows’ benefits, adjusting benefits for early retirees and disabled workers with earnings, etc.). Wait times now average four months for these tasks. Unless you're one of the people affected — and there are millions of them — all these might seem like minor inconveniences, but the underlying aim is to destroy the system: death by a thousand cuts ... or in this case, by millions upon millions of them. The majority of Americans visit SSA’s field offices at critical and, often, stressful moments in their lives. Many are preparing for the important, life-altering decision of applying for retirement or disability benefits. Some are contending with the death of a working spouse. And others, faced with poverty, are applying for SSI. At these moments in their lives, Americans depend on in-person service from staff members who have a detailed understanding of Social Security, and who can offer knowledgeable, personalized and compassionate assistance. At some point, we will have to handle every claim that comes to us, every change of address, every direct deposit change, every workers’ compensation change, every request for new or replacement Social Security cards. The longer it takes us to get to this work, the more it costs to do. Now Republicans in Congress just want to make matters worse, with cuts that will require 10 furlough days — which equates to a two-week shutdown of Social Security. “Government doesn't work,” they're saying, “Watch, we'll show you how to make sure!” The amount of money involved is trivial — about 7 cents for every $100 of benefits paid. And it all comes out of money that recipients have paid into the system themselves. Bear in mind, this is what the “responsible Republicans” in Washington are doing — more of what they've been doing since the 2010 midterms gave them control of the House. Trump, of course, has nothing to say about it. Yet this is the epitome of what he repeatedly rails against — the way elite politicians treat hardworking Americans with disdain. The fact that it's happening in the middle of a campaign when Trump is supposedly repudiating GOP austerity and fighting for the working class only sharpens the irony. So there it is, as clear as day: Trump will be happy to sign off on Ryan's agenda after getting elected. He just knows damn well it's not what the American people want. The core of the agenda is first cuts, and then privatization. But slashing services in the meantime is key to souring the public on fighting against what's coming next.